You are here: Home » Ready Steady, Cook! One of the things that characterizes the place where we live are local recipes and dishes. In this activity, students develop their own traditional recipes based on family tradition and home cooking. Their recipes are uploaded onto a classroom blog. The first step in this activity is to research some local, regional or national dishes – even better if you can arrange a tasting session! Discuss the ingredients and which ones make the dish sweet, savoury, tangy, bland etc. Explain to the class that they’re going to choose one dish/recipe and re-invent it/make it their own by changing ONE ingredient. So for example, most countries have their own versions of broths, stews or soups, learners would need to add/change one ingredient, perhaps including a vegetable from another country e.g. pumpkin. If for example they need “milk” in the recipe, children can write the word in the search engine and all of them should chose among all the pictures to be downloaded. They then have to note what quantity of each ingredient is required (it may be necessary for you to give them this information). When you have all the pictures, use an interactive whiteboard to write each steps of the recipe and to add the pictures they have downloaded previously. Once the recipe is completed upload it to the blog with a message addressed to learners’ parents inviting them to cook the recipe at home with their children. Encourage them to take pictures of children while they are cooking. Ask parents to email the photos to school. Use the interactive whiteboard to open email and allow children to upload their photos as cooks to the classroom blog. For more open access software please visit the Taccle website. This activity is highly motivating and interesting because the family is included in the learning process and participates in the learner’s experience. Using It to create greater home-school links is also very worthwhile. It is advisable to inform families about this activity beforehand. Encourage them enter into the spirit of things and to dress their children as cooks. You may like to highlight the opportunity for them to have fun as a family. It is unlikely that every child will participate, but do not be disappointed, all learners will have the opportunity to share in the preparation and resulting blog. Make sure that the images of children that are going to be published in the public domain have parents’ permission. We tested this exercise with 4-5-6-year-olds in a school in Antwerp. Since we were teaching the toddlers about the bakery, the children suggested making their own loaf of bread. By means of a phased plan the toddlers managed to turn on the computer themselves. They typed in ‘baking bread myself’ in Google. 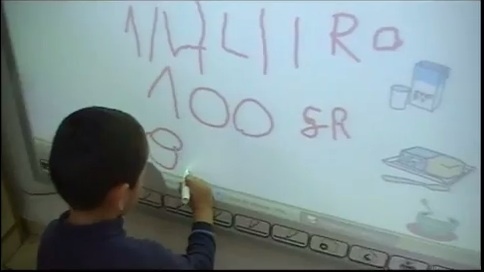 They did this with the help of a few key words that the teacher had written down for them on a piece of paper. After searching for a while, we found the recipe for white bread. We printed it out and drew a picture of all the ingredients we needed. Then we stamped the names of the ingredients next to them and also the amount of gram/ pieces we needed. We thought it would be cool to add a personal touch to the white bread… T. had brought sunflower seeds to class earlier that week. We really wanted to add these seeds to our bread. K.’s mom suggested that she would come to class and make a bread together with the toddlers. The toddlers explained to her what she had to do, which ingredients she needed and how much of them she had to take. It was a very fun activity! Me (the teacher) and the toddlers had a really great time. Sounds wonderful! Did you / they take any pictures we could post up? Would make a really nice Glog as well. I think this activity at the beginning would be a little difficult for the kids as if they are unfamiliar with the equipment would cost them to know how to use them. But once I learned that seems a very educational activity, not only for themselves but for their parents, so they can see the importance of becoming involved in the educational process of their children. A lovely activity for parents and children. Fun and motivating. The trouble is that in Spain there is no economic resources in the classrooms so that children have these technological instruments. I find it a fun and innovative use of technology, through the creation of food recipes. It’s fun for students seeking photos and change at least one ingredient, and will feel that they have created their own recipe. I like the idea that children become familiar with the technologies, including interactive whiteboards and they think it will, too. Yo creo que esta es una actividad bastante interesante y práctica, porque, además de adquirir conocimientos culinarios básicos, adquieren habilidades básicas sobre el manejo de las nuevas tecnologías. Hola!En mi opinión, me resulta interesante esta actividad ya que se interviene en el aula con medios tecnológicos y a la vez se están aprendiendo numerosas cosas(como por ejemplo, aprendizaje curinario); y también aprenden a interactuar entre ellos (alumnos, profesores y padres). Me parece una actividad adecuada para los niños. Les permite conocer sus platos y recetas tradicionales de su cultura. Utilizan las TIC, como blog de clase, pizarra interactiva, fotografias, etc. Una cosa importante, es la colaboración de las familias de los niños en el proceso de enseñanza aprendizaje. This activity seems to me to be innovative and entertained, especially if the family is involved in the activity by means of the blog and the wardrobe. But simultaneously I think that it would be destined to five and six-year-old children, since they manage better with the vocabulary and with the quantities, in order that this way they have more conscience of what they do.